Alpha Beta Sigma Sorority, Inc. was the brainchild of Guiding Light Daniela J. Lopez. On February 6 of 1998, Daniela expressed the idea of a sorority that catered to more than just African American women to Guiding Light Latasha P. Lessington. Latasha thought that is was a great idea, but felt it needed more nurturing, so off to Lockwood Library she went, where she spent a great deal of time learning about Greek life,it's origin and other organizations. Latasha then brought this knowledge back to Daniela, from there they utilize the greek alphabet to come up with a name. They comprised a list of names based on dictionary, and personal meanings. That was when they decided, this was something they were going to need help with, so Daniela and Latasha first recruited two women, whom they knew were strong, intelligent, and dedicated. Those women are Guiding Light Shavonne R. Wyche and Guiding Light Monica Burgess. Then the colors were chosen by Latasha. From there the colors were defined, voted on, and passed as the official sorority colors. Yet, they still felt the need for help, so they recruited Guiding Light Naeemah A.Carre. After these five women got together and decided that this was something definitely worthwhile, they took it to the greek advisor at the State University of New York at Buffalo, Frank Ciccia. Ciccia notified the five women of the procedures to acquiring recognition from the school and from CFS (The Council for Cultural Fraternities & Sororities). The women were notified that before they could go before council, they had to have a membership of at least ten. Well that wasn't an easy task. Many were interviewed, but few met the requirements, or exemplified the necessary dedication. 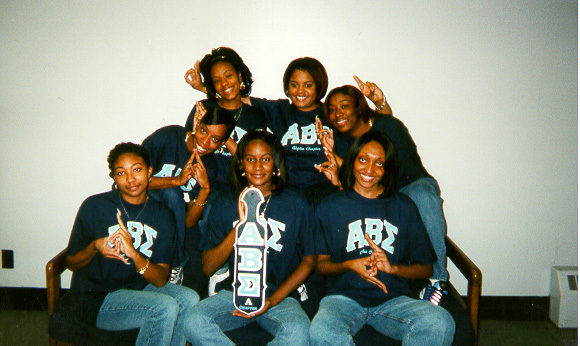 Finally six more women were recruited to assist in chartering the Alpha chapter of Alpha Beta Sigma Sorority. From mid February to mid April the eleven women became ten. They educated themselves on Greek life,it's origin and the Greek system, as well as developing their own traditions and history at the State University of New York at Buffalo. On April 18th these women reaped the fruit of all their hard work, and were sworn into the organization. From that day forward the ten women continued to develop on the foundation and goals of the organization. Through the constant face of adversity, these women continued to uphold the beliefs of their beloved sisterhood. Alpha Beta Sigma is a service organization. We seek and promote the highest ideal of womanhood by cultivating not only the power and passion for seeking intellectual development, and knowledge of ones heritage,but also the spirit of love, and charity in every aspect of our lives. The Founders of Alpha Beta Sigma embarked on this long and treacherous journey with the intent to bring about a union between women of color through enlightenment and service within the community.